Today was an early one! 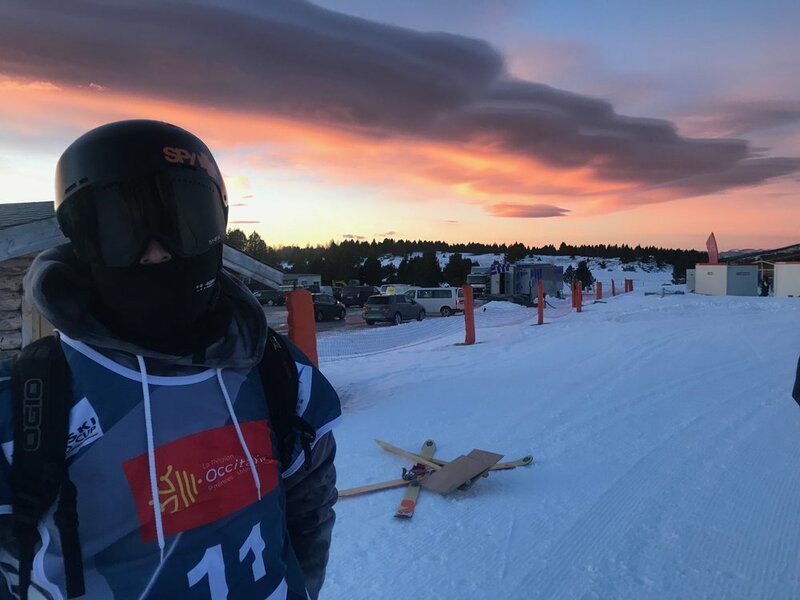 Seeing as how our heats were pushed back a day we had to get up at the crack of dawn to head up to the hill to make sure we could get our qualifications off. Beautiful sunrise before practice started! We got to the top of the course and the sun was just popping out, I think it might have been the earliest I have ever been up at the top of a course waiting to drop in for training. The sun popped and training was on, something happened that I didn’t expect that was sort of funny.. Since the sun had just risen over the mountain it was pointing directly into our eyes, I hit the first jump in the course and right when I took off I was completely blinded by the sun! It was such a terrifying feeling being up in the air and being blind for a second and not being able to see the landing or anything! Luckily I pulled it together but man was it scary haha! Anyway once the sun got a bit higher training went great and I was starting to feel like I did the other day before it got postponed which I was stoked on. I dropped in on my first run feeling great, everything went the way I wanted it to except for the 3rd jump feature where I was a bit short on speed but managed to improvise last second and put something down! My 1st run score was a 75.66, which was ok, but I really wanted to improve it to secure my spot into finals. On my second run I stepped up my game but bobbled on one of my grabs, which put my score lower than my 1st run. I was pretty stressed out at this point because they were only taking 4 people from each heat to finals. I managed to wait it out ( after some stressful time looking at the scoreboard) and ended up qualifying through to finals, which I am hyped on! Finals are going down tomorrow and I am hyped! Stay tuned!